With a layer of melted butter, batter, and fruit, this simple “Cuppa Cuppa Cuppa Cobbler” strays from the typical two-layer cobbler with fruit on the bottom and a crumble or biscuit on top. 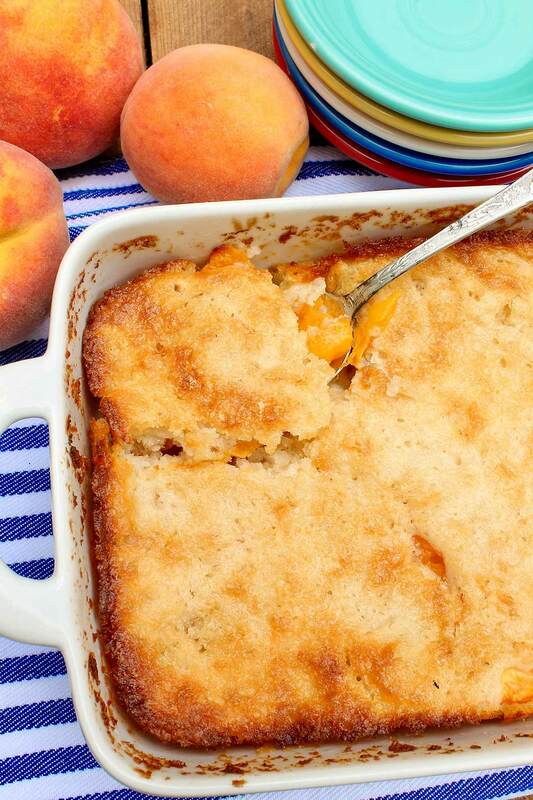 Then, as this cobbler bakes, the batter rises up and over the peaches and forms a cakelike treat, the edges of which become lightly crisped by the melted butter. August 22 is my dad’s birthday. So when I read recently that this dog day of summer is also “National Eat a Peach Day,” I knew he’d appreciate the fitting overlap. Though my dad has never done much cooking, in many ways he’s the person who taught me to eat with the seasons. While Mom typically made the weekly grocery runs, Dad was a Central Market regular, bringing home an ever-evolving rainbow of produce for all to enjoy. Peach season—his favorite—called for special runs to Cherry Hill Orchards. I asked him recently when he began these weekly trips, and he told me he first went for apples 40-some years ago, when the store was located on New Danville Pike. 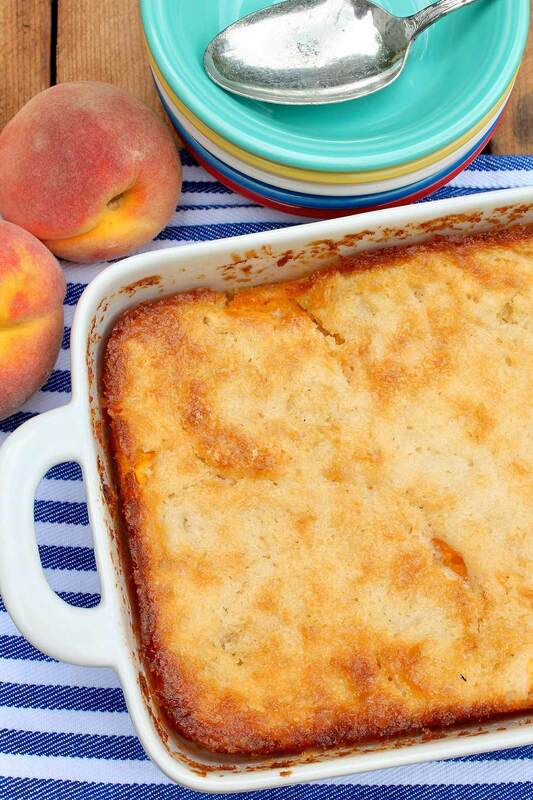 So while Dad’s birthday and National Eat a Peach Day are a couple weeks away, I’m sharing his favorite peach cobbler recipe now, for those who, like Dad, may wish to enjoy it several times throughout the all-too-fleeting peach season. The recipe’s catchy name refers to the amount of flour, sugar, and milk included in it. I first enjoyed this dessert at the home of a childhood friend many years ago, when it was whipped up for last minute guests using canned peaches and a full stick of butter. Fresh peaches elevate the dish, although the canned variety may certainly be used for an easy winter treat. (In this case, drain them first.) As for the butter, I found that a lesser quantity supplied plenty of flavor and a nice crispy edge without the hint of greasiness I sometimes noticed in the original recipe. Though intended and typically enjoyed as an after-dinner dessert, Dad considers this treat akin to a donut and occasionally enjoys a serving after his daily bowl of cornflakes. My mom lights up when I heap in additional fruit—requiring extra cooking time and occasionally resulting in overflow! With a layer of melted butter, batter, and fruit, this simple recipe strays from the typical two-layer cobbler with fruit on the bottom and a crumble or biscuit on top. Then, as this cobbler bakes, the batter rises up and over the peaches and forms a cakelike treat, the edges of which become lightly crisped by the melted butter. Place the butter (as is–you will melt this soon) in an 8-inch square or similar size baking dish. Set aside. Once the butter has fully melted, remove the baking dish from the oven, and pour the batter over the melted butter. Do not stir. Bake the cobbler for 35 to 45 minutes. The batter will rise up and around the peaches as it cooks. You’ll know the cobbler is cooked throughout when the edges are a deep golden brown. Check a few minutes early and adjust the time if necessary, as all ovens vary. Serve the cobbler warm or at room temperature, with a scoop of optional ice cream or whipped cream.To best preserve freshness, cover and refrigerate any leftovers. When peaches are very ripe, the skins will often peel off easily. If this isn’t the case, score an “X” on one end, and then immerse in boiling water for 30-40 seconds. The edges of the “X” will begin to peel back. At this point, the skins will peel off easily. Canned and drained peaches may be used when fresh aren’t available. This recipe has proved to be fairly flexible over the years. For instance, I’ve baked the cobbler at 375 degrees F, reducing the cooking time slightly. For a bit of caramelized sweetness, I’ve sprinkled a tablespoon or so of additional sugar over the surface at the end of baking time and broiled for a minute or two, watching very closely to avoid burning. I’ve also varied the pan size. I tend to use an 8-inch square or similar size rectangular dish (pictured) because I like the batter to be a bit deeper, but I’ve actually baked a thinner version in a 9×13 pan and it did work. I’ve added extra fruit (in this case, watch for overflow and place a baking sheet under your pan for added insurance! ), and mixed the peaches with a variety of berries. As always, be sure to monitor closely if you deviate from the recipe. Ann, how do you think this recipe would fare if I halved it and used an 8- or 9-inch square pan? We love peaches here, but there are just two of us! I’ve made the full recipe in a 9×13 pan and it was thinner but worked well. Based on that I’d say halving the recipe and baking in an 8-inch square pan would be the way to go. Just check the time a little early. And feel free to report back! Thanks Ann! I realize now that I misread your instructions, which call for an 8-inch pan. I think I’ll try it with something smaller, and I’ll let you know. It would actually be interesting to try half a recipe in a 9×5 loaf pan if you have one of those. The recipe would be a little thicker as the adjusted proportions would be cooked in a slightly deeper pan, but it could work quite well! Great recipe! I bought peaches on Friday thinking I would make a traditional cobbler or crumble with oatmeal, butter and brown sugar. This recipe showed up in my mailbox at the right moment. I’m with your dad on this one – I’m having leftovers with my tea this morning. Thanks for sharing! Sounds like the perfect way to start a Sunday morning, Mary! So happy the timing worked out so well and that you enjoyed! Made the cobbler last night for company and it was a hit! Great news! Thanks for letting me know! Delicious! A new summer favorite to be enjoyed again very soon! So happy to read your comment, Susie! I’m so impressed! I bet it’ll be wonderful! I love it…and I love that your son is baking for you! 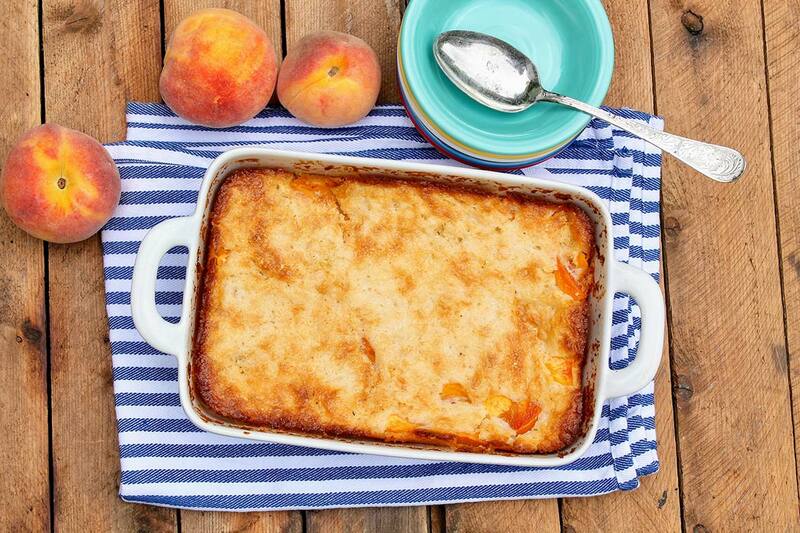 The recipe states to make the cobbler in an 8×8″ pan, but the picture shows a 9×13″ pan. I’m confused! Hi Meg, I mention using an 8×8″ or similar size dish, and the pictured dish is actually a small rectangle with the same area. As I mention in the notes, this recipe is quite flexible so you could use a bigger dish. That said, I do prefer the thicker end result achieved when using the smaller size that’s stated. Hope that helps! Hi Ann, Is it really a Tablespoon of baking of baking powder? That sounds like a lot for the amount of flour! It’s funny Trudy… As many parts of this recipe that I’ve toyed with over the years, I’ve always kept the 1 tablespoon of baking powder (as it appeared in my original recipe) constant. I never notice an off taste and think it helps the batter rise up and around the fruit. That said, I might try it next time with a teaspoon less, just to see if I can detect any difference! Ann I’m making this for a crowd. Is it ok to double and bake in a 9×13 or do you recommend making two 8×8? Also, is there any particular variety of peach you think works especially well in this recipe? Since it is peach season I thought I would ask. Thank you so much for all the wonderful recipes. Your site is my go to and I use it several times a weeks. Hi Elaine, First, thank you for the kind words. I am delighted you’re a “regular!” I wouldn’t hesitate to bake this in a 9×13 unless you want more of the crispy edges. That would be one advantage of baking in two smaller pans. The pan size and oven temp are somewhat flexible, so you can fiddle a little either way depending on what you have to work with — i.e., a 9×9 pan, raising the oven temp to 375 if you cook in a larger pan and you think it needs a little more browning (and a doubled batch would likely need a few more minutes in the oven), etc. 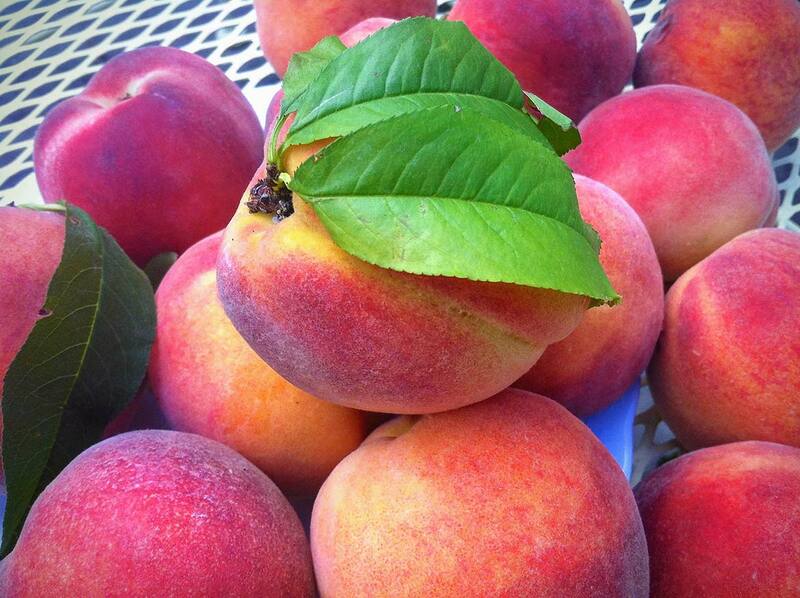 As for peaches, I have two favorite places to buy peaches locally, and they are always good, no matter the variety. I’ve even used white peaches, which can be so delicious, too. I hope that helps and that the cobbler is enjoyed by all! I’ve made this recipe numerous times and it is oh-so-easy to whip up and it’s absolutely delicious!! I noticed you said your dad went to Cherry Hill Orchards, I was raised in Lancaster Co. ( moved away years ago) but still have family we visit. We love to roam the countryside for these wonderful markets, and Roots Market is one of our favorites for getting fresh, local fruits, veggies, and assorted delicious goodies!! So nice to make the Lancaster connected, Dee! Roots is another great spot — we’re truly spoiled here. I’m thrilled the cobbler has become an easy favorite and truly appreciate your comment! That cuppa cuppa cuppa was so YUMMY! I added chopped pecans and shredded coconut to the batter…. Wonderful, Bertie, and I love your addition of coconut and pecans! Made this last night with local fresh peaches and it is scrumptious!! Thanks for sharing this recipe! So happy you made and enjoyed, Elizabeth! This is the time of year I get a little sad because the end of peach season is so near! I’m not sure if I missed it but, salted or unsalted butter? I typically use salted but you can absolutely use unsalted if you prefer. This is an old old recipe from who knows. We lived in the mountains and this was always a staple dessert. We always picked the wild blackberries growing along the roadside or in fields and mama would make this and we sometimes had it for supper with a scoop of vanilla ice cream! So good when it’s right out of the oven with the ice cream melting all around! Also, she used a whole stick of butter! Can’t go wrong with this and you can use any fruit. Yum on! Love your comment, Lea. The wild berries would have been such a treat. We often ate strawberry shortcake for dinner when I was growing up, so I can appreciate cobbler for dinner. And hot out of the oven with a scoop of vanilla ice cream…perfection!